I really thought this press release was worth sharing, just for the uniqueness of it all! And it totally fits in with the history theme we have going on this fall. If you can make it to Washington state, check it out and let us know what you thought, it looks fun! Lake Crescent Lodge will be reliving a special time in the history of Olympic National Park on September 20th and October 4th when the twenty sixth President of the United States, Theodore Roosevelt and his wife will visit. 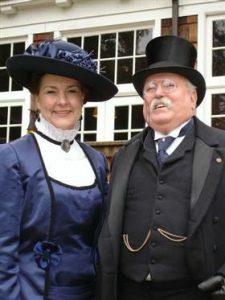 Dressed in period attire, Ron and Carol Browning of Port Angeles will bring history alive as they re-enact Theodore Roosevelt and Edith Kermit Roosevelt. Ron Browning states that people often told him how much he resembles Theodore Roosevelt which gave him the idea to learn more about the man and pose as the President in presentations to help educate the public. The Brownings are passionate to encouraging people to read about Theodore Roosevelt and to better understand the ideals that he envisioned for America and the world. Carol Browning is the seamstress for the team, creating beautiful and historically accurate costumes for both of them. Carol created the Presidential frock coat and top hat for the Presidential appearances and some very attractive gowns and fancy hats for Edith Roosevelt. Ronald states that he and Carol may be the only team bringing both the President and Mrs. Teddy Roosevelt to the public. They took a two week vacation through five of the National Parks and stayed in character the entire time. They have appeared in parades and many historical celebration activities. The Brownings feel privileged to be able to bring the Roosevelts back into public view. People ask questions, listen intently, and are overwhelmed by the occasion to learn about the President who ushered in the twentieth century for the United States of America. This free photo opportunity will take place at Lake Crescent Lodge in Olympic National Park, Washington from 11 am – 5 pm on September 20 and October 4. The Lodge will also be serving a special commemorative menu that was served at Lake Crescent Lodge to another famous president, Franklin D. Roosevelt in September, 1937 while he stayed at Lake Crescent. Roosevelt was contemplating the designation of the Park to National Park status. Reservations can be made for the Sunday dinner by calling (360) 928-3211. Theodore Roosevelt’s most effective achievements were in conservation when he added enormously to the national forests in the West and set aside lands for public use. U.S. President Theodore Roosevelt originally created Olympic National Monument in 1909 and after Congress voted to authorize a redesignation to National Park status, President Franklin Roosevelt signed the legislation in 1938. In 1976, Olympic National Park became an International Biosphere Reserve, and in 1981 it was designated a World Heritage Site. In 1988, almost all of the Olympic Peninsula was designated as the Olympic Wilderness, further enhancing the protection of the region. Forever Resorts manages Lake Crescent Lodge, Hurricane Ridge and Fairholme Store in Olympic National Park. Their other locations consist of an exceptional collection of destinations that provide hospitality services throughout the world. Forever Resorts focuses on properties with access to nature and one-of-a-kind surroundings for vacations.